In case you're curious about the header image, that is the Liberian Tanker Ocean Eagle sinking in the harbor off of San Juan, Puerto Rico on 3 March 1968. The accident was devastating to local ecosystems as it was the most severe oil spill experienced in U.S. territorial waters up to that time; in its wake came improved methods for containing spills and improved tanker safety practices. I have gone through various U.S. government publications, however they are careful to remove references to owners and the name of the ship's captain. If anyone might know of the shipping company that manned the ship at the time of the accident, I would be keen to obtain their hat badge. American-Hawaiian SS Co. hat badge. Faint H & H (Hilborn & Hamburg) hallmark on eagle wing. Gemsco hallmark on flag. Eagle and shield sterling plate over copper; wreath brass/gold-plate. Second World War era. As follows is an essay on the history of American-Hawaiian Steamship Company. Collecting the data on this specific company is somewhat responsible for the prolonged hiatus in blog postings. I hope that the history behind the badge warrants the absence of images. More images will follow in a couple of weeks... I'm going on vacation for a spell. American-Hawaiian Steamship Company (A-H SS Co.), 1899-1956. The story of American-Hawaiian Steamship Company mirrors the fates of several large steamship houses in the United States: scramble for capital, flowering of activity, failed business models, take-over by a large conglomerate and final dissolution. A-H SS Co. is unique in the fact that at one point it had the largest U.S.-flag merchant fleet and then dwindled to nothing. A-H SS Co. was engaged in intercoastal (U.S. Atlantic-to-U.S. Pacific coast) and foreign trade - although, as it name implied, it originally provided the majority of the steamship freight service between the mainland United States and the Hawaiian Islands. After the annexation of the Hawaiian Islands by the United States on 7 July 1898, George S. Dearborn, who owned a fleet of sailing vessels, decided to establish a modern steamship service between New York and Hawaii. In order to finance this venture, he sold his fleet of sailing ships and raised additional capital from investors - notably his brother-in-law, Lewis Henry Lapham. Almost a year later, on 7 March 1899, Dearborn organized the American-Hawaiian Steamship Company. Dearborn served as president of the company, with Captain William D. Burnham as general manager - Dearborn was president until his death in 1920; Burnham held his appointed post until 1914. Immediately after incorporation, A-H SS Co. ordered new steamships from the local New York and New Jersey shipyards, with Dearborn securing contracts to bring sugar to the U.S. mainland from the Big Five (the main business conglomerates in the islands). Service was to begin in 1900, however A-H SS Co. found its ships requistioned by the U.S. Navy for emergency duty to counter the Boxer Rebellion in China. Only in January 1901 did the promised service begin. For the next 14 years, under the protective umbrella of U.S. cabotage laws, the relationship that A-H had forged with the Big Five proved mutually beneficial and was source of prosperity to the company's U.S.-flag ships. Of the of several innovations A-H SS Co. ushered into the steamship trade, starting with their first voyage, A-H SS Co. steamships used the Straits of Magellan rather than the longer route followed by sailing vessels around Cape Horn. A problem that faced steamships in the long voyage from New York to Hawaii was the logistic problem of coaling. Although Chile was a natural stop off point for re-supply, Chilean coal was of low-quality and quickly exhausted. This very problem vexed the great powers of the period, and colonial history is rife with seemingly far-flung islands annexed for the very purpose of servicing navies. A-H SS Co. did not have the luxury of arms, therefore resorted innovation. Alternatively, A-H SS Co. supported the efforts of Valdemar Frederick Lassoe, its chief engineer, to develop an oil burner for the company's steamships. The oil burner was first fitted in the S.S. Nebraskan, which completed its first voyage from the Pacific to New York in 1904; the results so impressed the U.S. Navy that it launched a program to convert warships from coal to oil. In January 1907 A-H SS Co. took advantage of the opening of the Tehuantepec Railroad across Mexico to divide its ships into two fleets: one operated on the Pacific Ocean, while the other fleet handled the cargo on the Atlantic between New York and Tehuantepec. This arrangement lasted until 1914, when revolutionary turmoil in Mexico shut down the Tehuantepec Railroad; while the opening of the Panama Canal on 15 August 1914 provided an economical alternative. However, landslides closed the Panama Canal between 13 September 1915 and 15 April 1916, thus forcing A-H SS Co. to use the Straits of Magellan one last time - albeit under oil power. The company's heyday was in this early period. With its offices at 8 Bridge Street Maritime Building in New York, A-H SS Co. steamers sailed from the renovated Pier 56, Bush Terminal, South Brooklyn, every six days laden with freight for Pacific Coast Ports and the Hawaiian Islands. Through bills of lading, cargo was accepted for Puerto Mexico and all points along the Tehuantepec National Railway, Vera Cruz & Isthmus Railway, Pan-American Railway and ports along the west coast of Mexico and Central America. From Hawaii and San Francisco, steamers left for New York every twelve days. The company used San Francisco and Puget Sound as a way station for freight destined for Vera Cruz and New York. Commerce was good. The positioning of the company in the Hawaiian trade could not have been more secure, yet when the First World War began in 1914, Dearborn gradually succumbed to the temptation of chartering out most of his fleet in order to profit from the record-high freight rates in the North Atlantic. In 1916 A-H SS Co. announced that it would suspend handling the sugar crop of the Islands; not surprisingly the Big Five and the Territorial Government of Hawaii felt betrayed. As a reprisal, the Big Five vowed that A-H SS Co. would never be able to return. Henceforth, the Matson Navigation Company, enjoying the full support of the Big Five, emerged as the principal ocean carrier of the Islands. Once the wartime profits evaporated, A-H SS Co. realized it had foolishly abandoned long-term stability for the sake of short-term gains - the company did keep its original name, in the hope of returning one day to Hawaii, but more as a reminder of the prosperous days when it had been the largest U.S.-flag merchant fleet. In 1920, after the government returned the vessels requisitioned during the war, A-H SS Co. decided to dedicate its fleet in intercoastal trade, mainly between New York and California. After Dearborn died on 28 May 1920, W. Averell Harriman became the principal stockholder of the company and assigned the management of the company to his United American Lines; all of this he affected in April 1920. The attempted merger proved more complex than expected, and soon Harriman realized that the financially troubled A-H SS Co. required its own separate organization, and to that end he appointed Cary W. Cook as its president on 20 March 1923. As a condition for accepting the job, Cook had specified that the company's headquarters be moved from new York City to San Francisco - not only because this was where he lived, but also because he felt the future of the company was in the Pacific. Cook put A-H SS Co. back on solid footing and also began the negotiations with the Grace Line - which was keen to sell its six vessels on the unprofitable intercoastal service. The purchase was concluded in June 1925 by Roger D. Lapham, who succeeded Cook as president that same month. The intercoastal route sailed every five days. As a further step to consolidate A-H SS Co. position as the leading intercoastal carrier, Lapham acquired one of its competitors, the Williams Line, in early 1929. Unfortunately, the intercoastal trade was proving to be rather unstable and subject to sharp rate wars, so Lapham correctly concluded that the company needed to enter into other trade routes. His most important move was the creation of the Oceanic & Oriental Navigation Company in 1928 to take over a line of U.S. Shipping Board vessels (USSB); A-H SS Co. and Matson each had a 50% stake in the venture, with Matson managing the government ships on the the Australia/New Zealand route, and A-H SS Co. managing those sailing to China, Indochina, Japan and the Philippines. When the Great Depression struck, A-H SS Co. was in an especially difficult state as the intercoastal trade so closely reflected the collapse of the American economy; Lapham considered a merger with the Dollar Line in 1930, but the negotiators failed to find a satisfactory arrangement. Ever the opportunist, in 1936, did Lapham purchase four steamers from the Dollar Line for A-H SS Co. as Dollar was desperately trying to remain solvent and not slip into bankruptcy. The U.S. government requisitioned the ships of A-H SS Co. and of all other lines during Second World War. The company received a War Shipping Pennant in 1944 with four stars - "4 Star Companies" were assigned anywhere from 75-100 vessels of Victory Fleet during the Second World War. Once the war was over, the company did not want the surviving ships back, which in any case were overage, and instead preferred to bareboat charter government vessels for the intercoastal trade and for a service to the Far East, at least until the post war shipping situation became clearer. After the war, these cast-off ships ended up as troopships for the MSTS or found service in the U.S. Navy. Despite not wishing to have its assets returned, A-H SS Co. did engage in litigation to recoup perceived losses at the hands of the U.S. Government. A particularly visible case was of the Alaskan, the Federal Courts upheld the Government's payment to A-H SS Co., claiming the A-H SS Co. was attempting to profit from war. With the ascension of Roger Lapham's son, Lewis A. Lapham, because the president of the company in 1947, his first action was to move the headquarters back to New York City from San Francisco. The company was wisely keeping its options open, but the Korean War panicked A-H SS Co. into buying six surplus ships on the mistaken assumption that high freight rates would continue indefinitely (obviously lessons were not learned from previous of the same sort). The ships had barely been brought when the intercoastal service took a downward plunge, and with each voyage piling up losses, the company had no choice but to suspend the intercoastal service in March 1953. For all intents and purposes, A-H SS Co. was no longer sailing. The question of what to do with the idle fleet vexed the stockholders, who reached the conclusion that the hope left was to shift to a foreign flag of convenience. Because the company had exclusively operated under the U.S. flag, the stockholders decided to bring in as an investor the billionaire Daniel Ludwig, whose experience with foreign-flag operations was renowned. Ludwig decided to use the company for his own plans, and in 1955, after a bitter takeover battle, he gained full control and sold off the ships and most of the assets of A-H SS Co., whose steamship career ended at this point. Ludwig, however, for purposes of tax advantages, kept A-H SS Co. as a paper company and involved it in real estate ventures. For the next ten years the company became embroiled in sundry schemes: first to build Roll-On/Roll-Off vessels, then container ships and finally nuclear-powered vessels. By 1968 the last of these schemes had failed, and Ludwig proceeded to liquidate A-H SS Co. as a first step toward making an extremely lucrative deal with Sea-Land. The A-H SS Co. house flag first appeared in publications in 1926; the flag was simply the white initials A-H on a blue field. 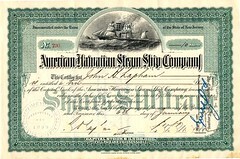 After the takeover, the flag was never flown again as American-Hawaiian Steamship Company became a paper company; and in the 1970s nevermore. Rene De La Pedraja, Rise and Decline of U.S. Merchant Shipping in the Twentieth Century (Twayne's Evolution of Modern Business Series). New York: Twayne, 1992. Penton Publishers, Blue Book of American Shipping (17th Ed.). New York, New York: Penton Publishers, 1913. pp. 315, 324. New York Times, 26 November 1948, 28 February 1953. Pacific Marine Review, November 1926. Jerry Shields, The Invisible Billionaire: Daniel Ludwig. Boston: Houghton Mifflin, 1986. War Shipping Administration, PR 2029. 24 September, 1944. F. J. N. Wedge, Brown’s Flags and Funnels. Brown, Son & Ferguson: Glasgow, 1926. Lloyd's, Lloyd's House Flags and Funnels. Lloyds: London, 1912.